Joseph and the Amazing Technicolor Dreamcoat was originally written as a 15 minute pop-cantata and was first performed at Colet School in London on 1 March 1968. It was the second collaboration between the two (then fledgling) musical theatre giants, Tim Rice and Andrew Lloyd-Webber. Since it’s first outing at Colet School, the show has made several West End appearances in various stages of evolution since 1973 but it’s most notable revival came when Jason Donovan, star of Australian soap opera Neighbours, headlined in the London Palladium production in 1991. Jump forward 15 years, leap-frogging past Phillip Schofield, Darren Day, Donny Osmond and Stephen Gately, Andrew Lloyd Webber launches his second BBC Co-Produced talent search show: Any Dream Will Do, hoping to replicate the success of its predecessor How Do You Solve a Problem Like Maria? the popularity of which sustained a healthy run of The Sound of Music for two years at the London Palladium. Unfortunately, audiences are fickle beasts and when the publically voted Maria von Trap, aka Connie Fisher, Do-Re-Mi-ed for the last time, the show’s popularity began to wane despite being replaced by the vocally superior Summer Strallen. And it is at this very point, that the current production of Joseph now finds itself. Any Dream Will Do made a West End star of Lee Mead, who had previously been a jobbing understudy on the musical theatre circuit, but after 18 months (and an alleged £10 million in ticket sales) he took his final bow on January 10th. Joseph and the Amazing Technicolor Dreamcoat is regarded as being one of the most dependably profitable titles in musical theatre, and West End producers are not stupid, they knew back in 1991 that if they put a well known star in the lead role the money keeps rolling in (sorry, wrong show). Enter stage right, Gareth Gates. Cynically, one could see the move of putting Gareth Gates in the eponymous role as a calculated cash-cow to keep the show afloat for a few months while the producers work out what’s going into the theatre next. Whether that be the case or not, what can be said of Gareth Gates is that if he’s given half the chance, he could not only keep the show afloat, but he could breathe fresh life into the production and take it to new uncharted heights. At his official debut in the role on February 9th, it was clear that the only Joseph he was going to be was his own. This wasn’t a forgotten pop star walking in the shadow of a greater performer; this was a man forging his own route. What took me completely off-guard about his performance was the unfeigned honesty with which he played the character. 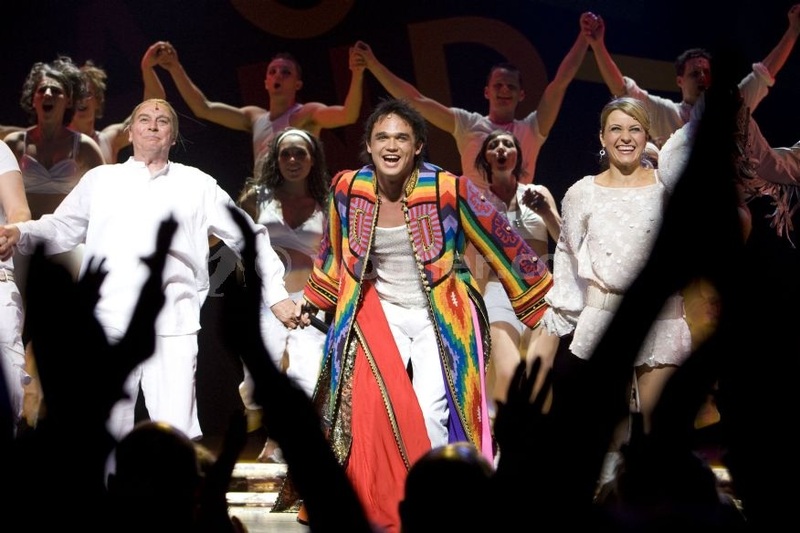 Unlike the unerring dignity of his predecessor, Gareth Gates plays the part with as much colour as the coat he wears. He gives the role a character journey that is often lost in the gaudy spectacle of it all. In the opening scenes he reveals Joseph’s infuriating arrogance that goads his 11 brothers to attempted fratricide – and quite frankly you don’t blame them, but that’s how you should feel – not until Joseph suffers the trials thrown at him in Egypt should you begin to forgive him as he learns humility. Again, Gareth surprises with his ability to play the fool, as he completely immerses himself shamelessly in the Benny Hill nonsense of the antics in Potiphar’s household with no apologies. Vocally, he brings the same amount of colour to the performance as he does physically. Beginning ‘Close Every Door’ almost inaudibly, forced the audience into silence, and we collectively wondered how he would reach the rousing finale, which he did magnificently, having wrong-footed our expectations with the desperately sober intro. In the closing scenes of the show, when finally reunited with the father who loved him most, Gareth delivered the reprise of ‘Any Dream Will Do’ with such a sense of loss and gravitas that it brought tears to my eyes (in spite of the inane sing-a-long chorus of “ah-a-ah!” from the audience). Joseph is fluff theatre, but its also extremely entertaining and uplifting theatre. And since Gareth Gates may quite possibly be the finest Joseph to grace the West End to date (supported magnificently by the incredibly talented ensemble cast), there is no reason why the show shouldn’t buck current trends and go from strength to strength!